As Nigeria builds up to improve its global ICT development indexes especially with relation to advancements in ICT skills and facilities, there has been a spring up in partnerships between the public and private sector. The Nigeria Communications Commission (NCC) in 2004 introduced an initiative known as the Digital Bridge Institute (DBI), established to offer trainings to entrepreneurs, young and veteran professionals, promote world-class research and also serve as a tool to drive advocacy and policy developments in Nigeria. With the rise in public-private sector partnerships to develop advanced ICT skills and facilities in Nigeria, the Digital Bridge Institute recently commissioned its world-class GSM/UMTS telecommunications network equipment laboratory in Abuja fully equipped with Optical Fiber Nodes, Wireless Radio Access Nodes and Ultramodern Next-Generation Core Switching Network with an estimated worth of about One Million USD ($1M), all donated by Huawei Technologies Company Nigeria Limited. In attendance at the commissioning were dignitaries from government sectors such as the Nigeria Communications Commission (NCC), Nigerian Navy, Nigerian Police Force, Nigeria Immigration Service, the National Television Authority, the media and representatives from Huawei Technologies Company Nigeria Limited. Engineer Titi Omo-ettu further expressed his optimism towards more partnerships with Huawei Technologies Company Nigeria stating that he hopes the partnership established three years ago will further blossom to improve the skills of the Nigerian graduates who needs the required skills to find their bearing in the industry. “This ultra-modern telecommunication equipment laboratory is put in place to train and equip Nigerians with relevant ICT skills for the 21st century to tackle challenges…Each equipment has elements that incorporate the skill development needed for modern telecom industry. From operating complex troubleshooting, the embedded learning systems deliver job-ready skills for the telecoms sector.” Dr. Adinde added. Speaking on the economic and social benefits of such a facility, Dr. Adinde added that “ICT technical education and training hold an important key to our development aspirations as a country…for sustainable development to take place, significant investment must be made in increasing skills of the workforce of the nation.” He expressed that this laboratory donated by Huawei Technologies Company Nigeria Limited is necessary for providing skills for young people to fulfil their career dreams by acquiring relevant industry-ready skills. 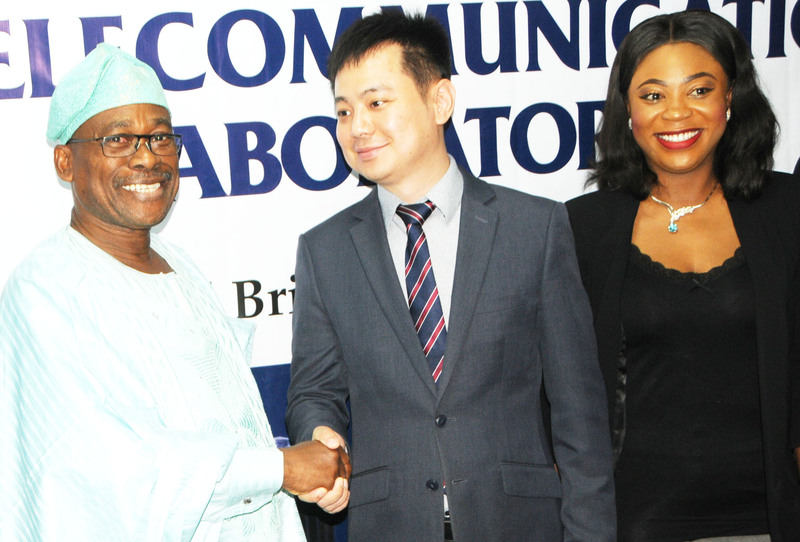 Also speaking at the commissioning was Mr. Kelvin (Yang Yang), Deputy Managing Director, Huawei Technologies Company Nigeria Limited, who expressed the company’s pleasure to seeing increasing ICT developments in Nigeria. “As a global leader in providing leading ICT solutions and innovations, Huawei Technologies Company Nigeria Limited is committed to seeing high-tech facilities and operations in the world, especially Nigeria.” Mr. Kelvin said. Huawei Technologies Company Nigeria Limited has been a key player in consistently contributing significantly to the growth and development of ICT in Nigeria over the years. This is attestable with its CSR programs such as ICT for Change which has been focused on training thousands of Nigerian youths and civil servants across the nation in the last four years. The company’s flagship global CSR program, Seeds for the future, focuses on providing world class ICT training to Nigerian students with a fully funded trip to China to experience global trainings and facility tours. Huawei Technologies Company Nigeria Limited has also been committed to enhancing rural connectivity across Nigeria to aid broadband and mobile penetration to unreached regions.